A creation that easily can be worn by a stylish woman who loves combining shades of purple and gold. Brought together, these hues create a high-impact visual that gives you a glamorous look. 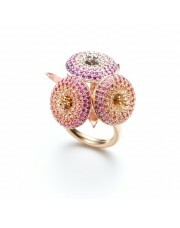 Each sphere has a different kind of gold – yellow, pink and white – and beautifully integrates violet sapphires. The Corindia ring is an astonishing piece to adorn your finger and generate the admiration of others for your good taste. Stand out through an amazing combination of colors and wear the Corindia ring with a dark green dress, be it a cocktail or a dinner gown. The mix is meant to bring a sense of the unexpected in your outfit and to attract a more sophisticated eye. Size: 7.5. It can be re-sized to any size. SERAFINO was created by Annegret Morf, a violin maker, and Antonio Serafino, a goldsmith, in 1999 in Montreal. The couple had just moved from Italy where Antonio had managed his own workshop and jewelry store in Florence. In 2005, the two decided to unite their energy and dedicate their business exclusively to the goldsmith art. The brand offers today an artistic vision that is bold yet delicate, subtle yet strong, and draws inspiration from nature, art, ethnic traditions and modern technology. SERAFINO creations balance traditional sense with a modern sensibility, translated in subtly-crafted expressions in gold, silver and platinum, often including precious or semiprecious stones and pearls.